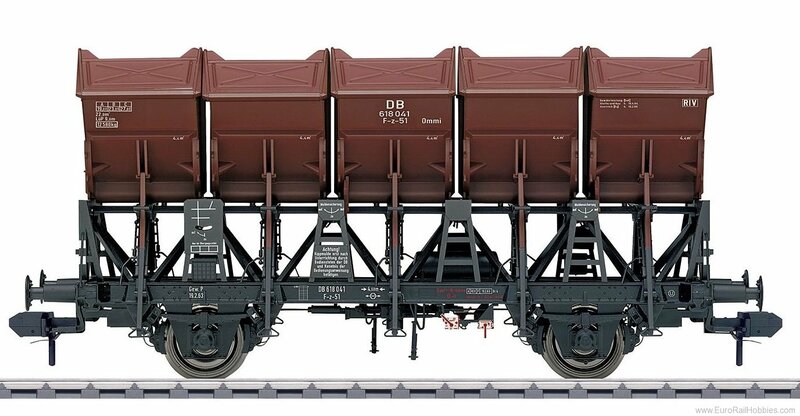 Prototype: German Federal Railroad (DB) type F-v-51 dump car without a handbrake, designed for the transport of bulk freight. Car number 618 041. Model: The main frame and upper longitudinal beams with supports are constructed of metal. The rest of the parts of made of high quality plastic. The grillwork and rail clamps are prototypically modelled. Prototype couplers are included. The minimum radius for operation is 600 mm / 23-5/8". Length over the buffers 28.5 cm / 11-1/4".